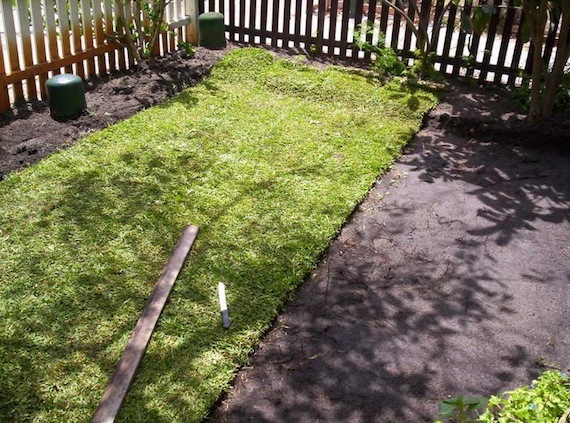 Laying a new lawn is a fairly straight forward and simple process, however it will involve some hard work and sweat. But, like all things it is worthwhile, and you’ll be glad you put the extra effort in when we see the final result. The following pictures cover a very simple Buffalo lawn laying job, there was no soil replacement undertaken, and the work was done to keep costs as low as possible for the homeowner. For larger areas you may need a kanga digger, or perhaps a bobcat. This photo shows the original turf area that was old common Buffalo grass, which is far inferior in quality to today’s modern Soft Leaf Buffalo Grasses. 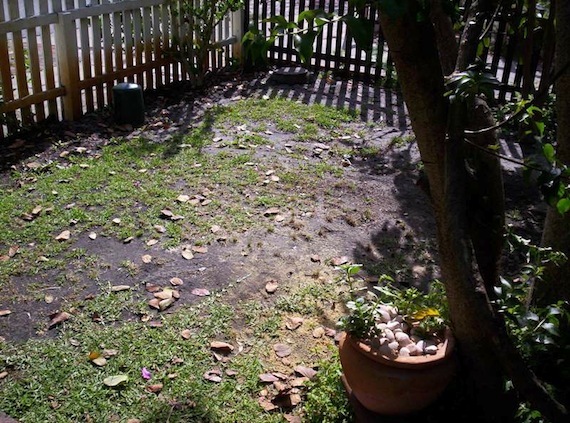 The area had been trampled by tradesmen and wrought and destroyed over the years as it was neglected and it also had shade encroaching onto the lawn. This lawn had to go, and a new and far better lawn type installed in its place. We’re also raised the height of the garden beds, at the same time, to give a nice visual effect to the overall appearance of the lawn and the garden. 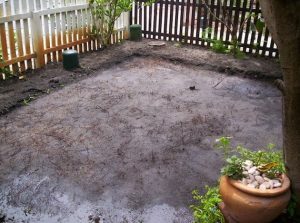 We’ve now removed the old turf and some of the top soil to allow enough room for the new Buffalo lawn to be laid. We have also removed enough dirt, so the turf will be laid low enough to not protrude above the paving area. As you can see from the photo, I used a simple straight-edge, which was a piece of nice straight pine, to level the soil area. Along with the straight edge, a spirit level would also aid in gaining a nice flat and even surface for the new Buffalo lawn. The easiest way to level the soil is to first go down length ways either on the X or Y axis, and level out as best as possible while not being too perfect. Next, level out the soil going across in the other direction. For example, if we first levelled from front to back, we then need to level from left to right. Keep repeating these processes, while using the spirit level to occasional make sure you’re staying as level as possible, and very quickly you will see the soil levelled out and ready for your new turf. This can be a tricky process for some people who have no experience with levelling. But, I had the advantage of a tiling background to ease the job at quick speed. If you wanted to add some Wetting Agents or Organic Matter to the soil, such as Dynamic Lifter, Blood and Bone or other products, now would be the best time. Using the Heavy Roller: Both during and after levelling, we want to compact the soil using a heavy roller to ensure there are no soft spots in the new lawn and soil. Water filled rollers can be hired from a hire shop. 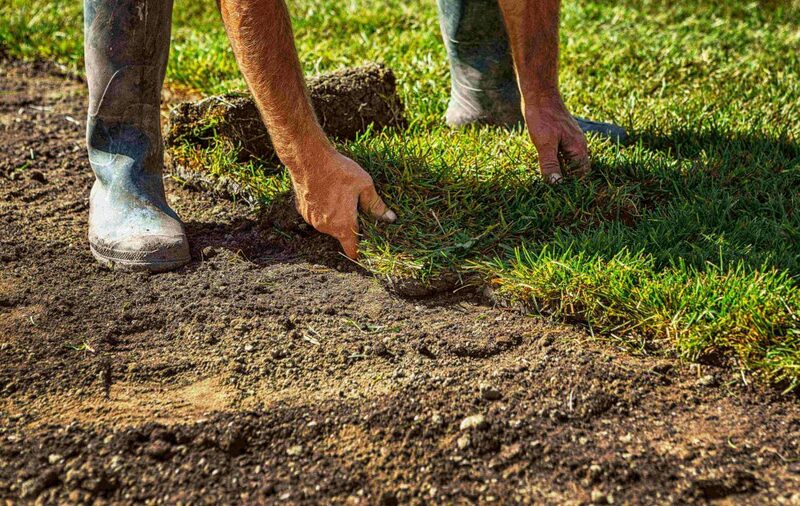 Loose areas of un-compacted turf can also cause a lawn to not root-down properly into the soil, causing the new lawn to possibly die off in these areas. We can’t show you pictures of the roller, as this was a one-man turf laying job, and it’s a little hard to photograph yourself while you’re using machinery! NOTE: If we were to add some sandy loam or other topsoil, we would have dug deeper into the lawn area to allow for the extra height of the new soil. For larger lawn areas it may be wise to use a kanga digger or bobcat digger to speed the work. If we wanted to add below ground irrigation, we would level off the soil very roughly first, and then install the irrigation pipes and sprinklers, and then level the turf properly, followed by installation of the new Buffalo grass. Once we’ve got the topsoil levelled, we’re ready to lay the new Buffalo turf. Notice that the soil is fully wet. We’ve applied a lot of water very slowly before the job was started, and during the levelling process to aid in screeding (levelling), as well as to ensure the soil profile was fully wet prior to the new Buffalo turf being laid. This will ensure the greatest possible chance of survival and quickest establishment for the turf. We roll out the first roll of buffalo grass along the edge, being sure we’re as straight as possible. It’s often wise to use a tape measure to measure an exact distance between a parallel object to the lawn. In this case, I measured the distance from the fence to the turf along the entire length of the first roll of new Buffalo lawn to ensure it was being laid straight. We begin to lay the second roll of new buffalo sod halfway up alongside the first. We want to create a brickwork pattern with the new buffalo lawn as it’s laid. We can also cut a turf roll in half and begin with a half roll at the top of the next section to be laid. Each new roll of turf should be pushed up tightly alongside the roll of turf next to it. We don’t want any gaps in the joins. Just be careful not to push the rolls of buffalo too tightly together, as this can cause an air-pocket to occur between the sod and the soil. 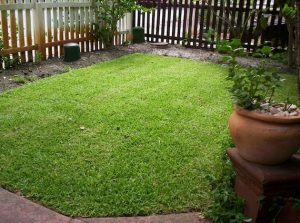 An air-pocket would be disastrous for the new lawn, which would struggle in any areas where the turf is not in full contact with the soil at all times. You can see from the photos that the turf is overhanging at the far end of the site. This was done on purpose to allow for the perfect cutting of the new turf and to ensure it was absolutely true to the fence line for a professional finish. We normally wouldn’t leave so much turf in the overhang, but in this job it’s just how the turf rolls worked out when being laid. Despite seeing the knife, we don’t do any cutting-in until all the new buffalo sod is fully laid. As you can see from the photo, the new Buffalo lawn is fully installed and has also been cut-in. We cut-in the far side using our same straight edge and a tape measure to ensure the cutting was parallel to the fence behind it. We also cut-in the edge to a perfect finish along the pathway, leaving the new Buffalo lawn sitting just below the pathway. We used the roller on top of the new Buffalo turf to ensure the sod and the soil were in full contact with each other. If any areas of new sod are not in full contact with the soil – it can cause the new Buffalo to die in these spots. A strong serrated knife is used for the cutting-in of the turf. Just be aware that this process will be a tough job on your hands, causing cramping and possible calluses for many people. A strong solid knife and a pair of thick gardening gloves are wise to use during this process! Our new Buffalo lawn is fully installed, and it looks great. We only need to do a very light watering to finish. This is because we fully watered the soil very deeply during the soil preparation process, so now we only need to water the new Buffalo grass sod itself. Also notice how much nicer the garden bed looks now that it’s been raised above the height of the lawn surface. It’s now two weeks later, the lawn has had a light trim with the lawn mower, and it’s establishing perfectly without any brown spots or any other issues whatsoever. The squashed leaf ‘flat look’ from the rolling process of the sod has almost disappeared completely, and the new Buffalo lawn is greening-up beautifully. The trees causing the excess shade to the area were also lightly trimmed to ensure the greatest chance of success for our new turf. This new Buffalo lawn installation was a success, and we reckon it looks great. A wonderful improvement over the old lawn. We continued to look after this new Soft Leaf Buffalo Lawn for another 18 months after it was laid, and it never experienced a single issue, everything went well, and the client was very happy. 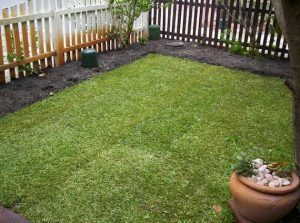 The only other thing which is needed to do after a new Buffalo lawn is laid, is to ensure adequate water is applied during its establishment phase. This is absolutely vital to getting it right! To select which Buffalo lawn best suits your home have a look at Prestige®, Sapphire® of Palmetto® Soft Leaf varieties.